As summer winds down and a new school year kicks off, RideKC welcomes another college to the U-Pass program. U-Pass lets colleges and universities offer transit passes to their students en masse, typically using an existing student ID as all-access transit pass. It allows students the flexibility to ride occasionally or every day, to school, to a job, or to shopping and entertainment. This year, students at the Kansas City Kansas Community College join this popular RideKC program. The agreement between KCATA and KCKCC wouldn’t have been possible without the hard work of Commissioner Melissa Bynum, who represents Kansas City, Kan., on KCATA’s board. KCKCC joins University of Missouri-Kansas City (UMKC), Kansas City Art Institute (KCAI) and Metropolitan Community College of Kansas City (MCCKC), which provide the U-Pass to all enrolled students. Over the last year, nearly 590,000 rides were taken with the U-Pass at UMKC, MCCKC and KCAI. This program makes a difference in the lives of students, saving them money and expanding their access to the Kansas City community. Last year, MCCKC and KCAI joined the U-Pass program. 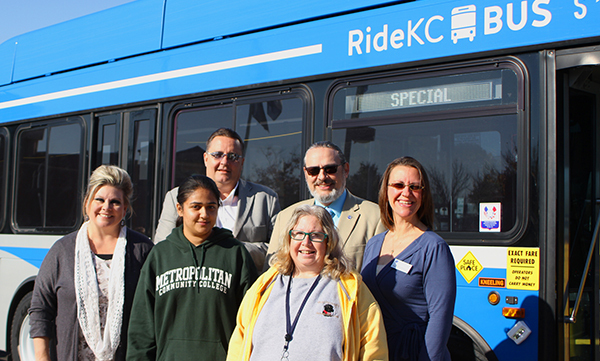 This year, Kansas City Kansas Community College joins the U-Pass program, becoming the fourth college in Kansas City to offer the transit program to students.